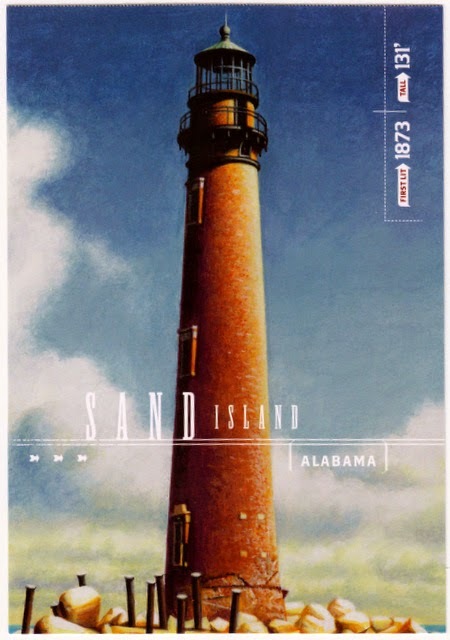 Postcard US-1987845 to Minnesota, USA shows the Sand Island Lighthouse located at the southernmost point of the state of Alabama, 3 miles or 5 kilometers offshore near Dauphin Island, at the mouth of Mobile Bay, Alabama. The 131-foot or 40-meter tall Italianate style lighthouse opened in 1838 to replace an earlier lighthouse destroyed by Confederate John W. Glenn on February 23, 1863 during the Civil War. Due to erosion and hurricane damages, it is on the Lighthouse Digest Doomsday List as one of the most endangered lighthouses in the country. The lighthouse is one of the five Gulf Coast lighthouses featured on postage stamps and a stamped postcard book with pre-printed 28-cent postage issued by USPS in 2009. Earlier on today, the 86th Birthday of Martin Luther King, Jr., Selma, a historical film based on the Selma to Montgomery, Alabama voting rights marches led by James Bevel, Hosea Williams, Martin Luther King, Jr. and John Lewis in 1965, was nominated for Best Picture and Best Original Song for the 87th Oscar Awards. However, as Selma's director Ava DuVernay was not recognized for her powerful work directing the film, it reinforced the perception that the Academy of Motion Picture Arts and Sciences, made up of predominately white, older men, is still falling behind in recognizing diversity. Today’s nominations see absence of black actors/filmmakers and female filmmakers nominated for directing or screenplay. The controversy becomes evident as the Twitter hashtag #OscarSoWhite is trending right now.